Immune cells play essential roles in the maintenance and repair of our bodies. When we injure ourselves, immune cells mount a rapid inflammatory response to protect us against infection and help heal the damaged tissue. Lead researcher Dr Helen Weavers, from the Faculty of Biomedical Sciences said: “While this immune response is beneficial for human health, many human diseases (including atheroscelerosis, cancer and arthritis) are caused or aggravated by an overzealous immune response. A greater understanding of what activates the immune response is therefore crucial for the design of novel therapies to treat these inflammatory disorders. The team’s research, published in the journal Cell, used the fruit fly (Drosophila melanogaster) to study how a particular immune cell (the macrophage) becomes activated in order to respond to injury or infection. Using the fly allowed researchers to make time-lapse movies of the dynamic behaviour of the immune cells as they migrate within a living organism. It also allowed them to easily manipulate different genes and signalling pathways within the fly, to test which genes are important for immune cell behaviour. 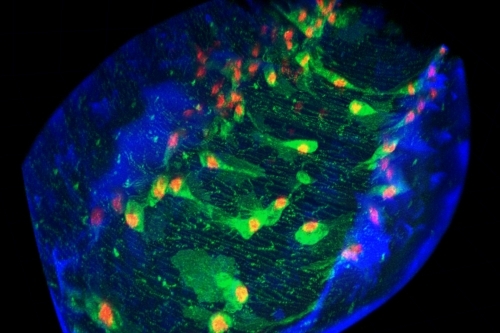 Using genetics, the researchers dissected the mechanism by which the molecular memory is generated within the immune cell. Ingestion of the dying cell activates signalling via a calcium flash, which leads to an increase in the amount of an important damage receptor Draper in the immune cell. High levels of this receptor enable the ‘primed’ immune cell to sense the damage signals that entice them towards a wound during inflammation. Without this priming, the cells are blind to wounds and infections.